The Punisher is probably one of the strangest comic book heroes out there. Unlike more traditional heroes, he’s just a normal man with an extreme grudge that fuels him on his adventures. Most people know the general story of Frank Castle: a war veteran who returns from the Vietnam War and settles down into family life. Things are going well, until tragedy befalls him when he sees his wife and two children gunned down in Central Park. That tends to be the extent of knowledge people have of The Punisher and that really is what this The Punisher MAX series is about. The comic is about the life of Frank and how he operates over a long span of time, about 30 to 40 years. One of the things I always found hard to swallow with The Punisher was how he could take bullets and broken bones but continue to function with almost no downtime. This series makes the whole thing make sense. Since he has years and year to operate, you hear things framed in terms of years passed since a major punishment last took place. This makes him feel far less like a superhuman and far more like a “normal” person. Going along these lines, there is still a surprising lack of superheroes in this world. This means that Spiderman never comes to save the day and problems like war and international relations issues aren’t fixed just because an immovable object shows up to save the day. When the world goes bad it doesn’t get better, it merely gets worse and worse. The series is also broken into storylines instead of one long series. Each storyline is five or six issues long and it keeps things interesting, because there are always different depraved people that need to be punished. Lastly, because this falls under the MAX Marvel line, the story and artwork can be as brutal as need be. There is a bevy of swearing, brutality, and racism throughout the comic and it truly feels like a bunch of gangsters and hoodlums interacting with one another and not just the writer getting his jollies off. The art throughout the series is well done though you can tell when the artists change volume to volume. This isn’t really a problem because it remains dark and seedy, and the emotions really come through well. The writing here is solid. Each character has a strong personality and since you know they’ll probably be alive for at least six issues you get to see what makes them tick. 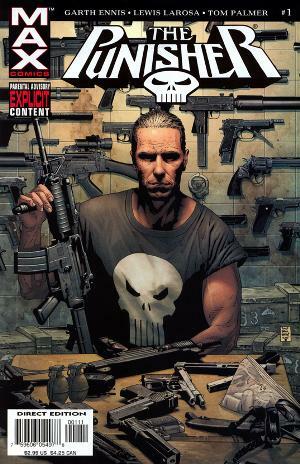 One thing that pleased me was the fact that there was never a single point in time where I felt like the authors wanted me to like Frank Castle. He is a complete and utter lunatic yet, throughout the comic, he seems to acknowledge it but is incapable of stopping himself from essentially being a mass murderer. His superpower is scaring the police away from arresting him and honestly, that is a superpower that usually is only left to the privileged. It is interesting to see this “liberty” extended to a calculated psychopath and to read what he does with it. I will give this an emphatic, YES. This 75-issue series has quick arcs and relatively interesting characters throughout. You won’t really feel endeared to the characters, but isn’t that the point of a vigilante who takes far more than the law in his hands and uses the training he received from the military to exact his brutal revenge? This will not be for everyone, but if you have any interest in the character this is the series I would recommend reading from start to finish, which took about a week reading six or so 25-pages issue a night.